After a season 10 in comics that lasted for 25 issues, a number close to that of the number of episodes in a television season, IDW switches to a season 11. However, much has changed since January 2013 when IDW announced this series. IDW seems to have resurrected the XF franchise at the correct time, preceding only by a short while the return of XF to the popular discourse. The revival of the XF live series both accompanied and reinforced the presence of the X-Files in people’s minds, with several retrospectives, art projects, podcasts and discussions having appeared over the past year and a half, and IDW’s comics are part of that general movement. What is old is new again, and popular culture has reached the point where late 1980s-early 1990s items are what is being recycled and what given inspiration to the creations of today. Joe Harris’ Season 10 in comics was successful in certain surprising ways thanks to its plotting, using a lot of fan service with the return of old (often deceased) characters, a staple of comics, and a close adherence to the show’s past mythology. However, in other ways it was overall it is not going beyond what tie-in merchandise confines itself to, drawing much more from the past and from what readers identify with the brand name, than evolving the concept and innovating with new topical threads. 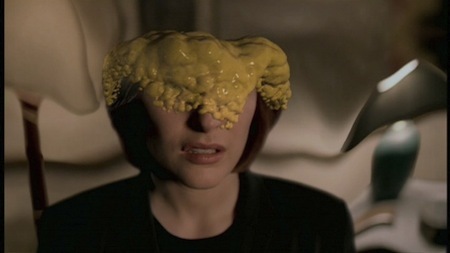 Season 10 did have several novel ideas and nicely incorporated in the X-Files’ fictional world several real-world elements in the way that the TV series did, however it veered little from the status quo of “two agents investigating the paranormal” despite the passage of time. Building off of Season 10, Season 11 could try to expand beyond that into unexplored territory. That being said, Season 11 comes into being in a very different context. The X-Files (live) revival will air when issues 6 and 7 of Season 11 will be published. The revival is being referred to as “Season 10” in several media outlets and even in the scripts and call sheets themselves. The risk that the IDW comics will be relegated to a non-canon “alternative universe” status, while it had been launched as a canon continuation of the story with the benediction of Chris Carter, is very real. Joe Harris has said that ideally the comics storyline will dovetail into the revival, i.e. that the comics Season 11 will end where the live series will begin. This is a seductive outlook, however given the first indications as to the state of things at the beginning of the revival series — not to mention the likely appearance in the revival of a certain character that was given a central role in the comics — this progressively seems as a challenge. Let’s not judge too early. The mythology Harris has created is worth taking more time to explore and resolve, one possible outcome could be that the comics series continue for a while — why not years? — before eventually wrapping up, either concluding where the revival series will start or confirming that this is an alternate world in which Harris has the full freedom to drive storylines where he wants and for as long as he wants. In all cases, it would be a shame to shorten the comics Season 11 because of the revival. Given the excitement around the revival, it makes full commercial sense for IDW to continue as it has: alongside the central line of Season 10/11 there is the Annual one-shots, the Jonathan Maberry-helmed “Trust No One” prose short story collections (of which at least 3 volumes are planned), the board game (for which an expansion pack is planned), the republishing of the XF comics of the 1990s (which is nearly complete already), the prospects of more comics (like the Lone Gunmen or Millennium), and who knows what now that the XF brand is hot again. And so Season 11 begins with #1, “Cantus“! Lowdown and spoilers after the jump! This first issue takes place two months after the events of the five-issue closing arc of Season 10, “Elders” (i.e. real time since the publication of #25 in June). Season 10 was very much like a copy of the way things were during the “Golden Age” of the series: two FBI agents out on the field, with a superior either compromised with the conspiracy (AD Morales) or their ally in the FBI (DD Skinner), and occasional help from their hacker friends. 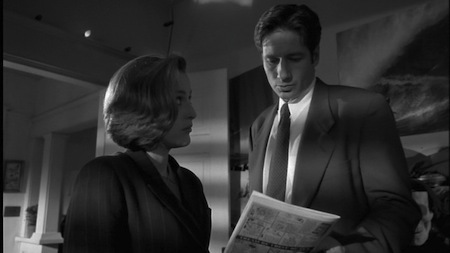 This issue establishes the new state of things: Mulder is a fugitive and follows missions given to him by Gibson Praise, willingly it seems; Scully is still in the FBI without any contact with Mulder and reluctantly has to accept orders from Gibson in hope of reuniting with Mulder; the Lone Gunmen are also fugitives, with their trademark Volkswagen van introduced in their spin-off series, now working solo; Skinner has been put on administrative leave. This issue is more or less the first one without the Cigarette-Smoking Man since his return in…S10#2! A fresh (re)start, it would seem. Mulder’s a fugitive — but now, unlike in season 9 (see 9X19/20: The Truth), of course he certainly can’t turn to Gibson Praise for help! Mulder’s undercover name is Anthony Blake, AKA The Magician from the show young Fox used to watch (2X01: Little Green Men), a name he was using when he and Scully were living under protection of the FBI (S10#1). He features a mustache in a reveal like the one of his beard in I Want To Believe! (no shaving scene though, the mustache proves fake) He has joined an expedition of what appears to be a group of government watchdogs formed ad hoc for this mission, to retrieve a satellite that was officially destroyed. A spy satellite for Air Force Command, the Medici 3 was publicly known as a radio telescope to scan deep space. Under telepathic orders from Gibson, Mulder contacted this group with a conspiracy theory and a salvage team was sent to retrieve the satellite in the Utah wilderness. 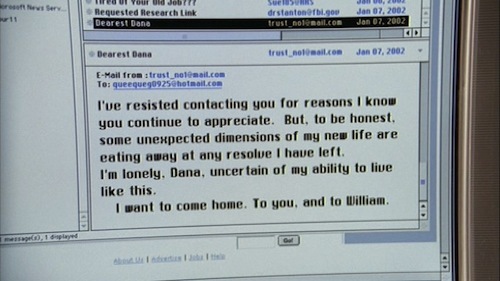 The group is led by Taylor, and Harris goes some way to build some tension and attraction between her and Mulder, along with some delicious meta references. Mulder ends up leaving the group to the mercy of hungry wolves — a change from the usual trigger-friendly Men In Black! — and returns alone with the communications hardware, which the Lone Gunmen identify as having been manufactured by a subsidiary of Cantus — described as a “conglomerate and rising star in the military-industrial and governmental-influence complexes“. On orbit, the satellite was exchanging signals with…forces up there — aliens, but which ones? — until it was ordered to self-destruct or shot down. Gibson is interested in retrieving the information the satellite collected. Interestingly, Mulder doesn’t tell the Lone Gunmen from whom he is getting his information. And it appears Mulder has learnt a few things since we last saw him, as he no longer resists Gibson — quite the contrary he is fully on board with his mission although he resents having no contact with Scully. “Everyone’s going to have to trust me on this. I’ve got everything under control.” Gibson says of him that he is “serving the most important purpose he could imagine: helping me do what I need to do”. This is the first time really that the lead characters are aware of something the reader is not, usually it is the other way around — bar the Mulder suicide manipulation in 4X24: Gethsemane / 5X02: Redux. It is an odd choice story-wise, given how the viewer/reader of the X-Files is made to identify and trust with Mulder and Scully — but it is a narrative choice that delays providing explanations to future issues. 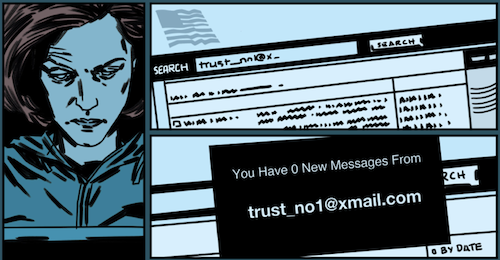 In the meantime, Scully is anxiously checking her e-mails for signs from absent Mulder in a scene directly reminiscent of 9X08: Trust No 1 and its flowery prose — complete with Mulder’s e-mail, trust_no1@xmail.com (actually in the episode it was @mail.com; you can try both but Mulder won’t reply, unfortunately). Once more, after #5 and again inspired by Fight the Future, Scully stands before an Office of Professional Review lead, again, by AD Cassidy or a look-alike (professional mobility doesn’t look to be among the Bureau’s concerns). Scully is about to be accused of espionage and sedition similar to Mulder when Gibson intervenes. Not content with just communicating telepathically, Gibson can induce sleep and loss of memory to others and take over the control of anybody he chooses. With such wild superhuman powers, what can stop him? Proof against Scully is erased, however there’s a hint that Morales might not have been entirely asleep. 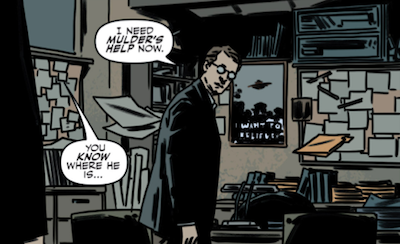 We get a glimpse of the good old X-Files office with the “I Want To Believe” poster, where Gibson assesses his authority over a discontent Scully. Scully gives a definition of the latin “Cantus…as in a choir song, or a chorus of angels. To sing, as though in praise of God.” The connection to Gibson Praise’s name, not something immediately apparent, is a particularly good find. Gibson enlists Scully’s help in order to help Mulder: the Peacock brothers from 4X02: Home are returning for S11 #2 & #3: Home Again! It looks like Season 11 is headed on a much more serialized storytelling, mixing its mythology elements with monster-of-the-week cases. Let’s see how this “new deal” of Season 11 unfolds. This entry was posted on Sunday, September 6th, 2015 at 7:33 pm	and is filed under Comics, News. You can follow any responses to this entry through the RSS 2.0 feed. You can leave a response, or trackback from your own site.